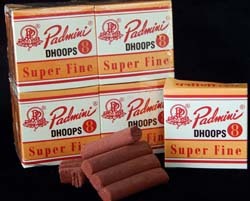 Padmini Superfine Dhoops - This Superfine fragrance is based on a woody balsamic note and is core-less (does not have a wooden stick at its core). It gives off a rich and full bodied fragrance as it burns. Each package contains 8 dhoops, or purchase by the dozen for more savings.